This powerful LT2000-VHT Laser Distance Meter is designed to operate off static or passing hot product with product temperatures up to 1,450°C even where the product inside the furnace. Measures off red hot glowing product at distances of up to 50M. The LT2000-VHT uniquely incorporates a fast processor that enables filtering out of non valid readings over a 100ms period and the ability to specify out of range tolerance of between 50mms and 50M. Straightforward alignment is easily accomplished via the visible red laser measuring beam. Accuracy of ±2mm to ±5mm according to averaging filter and velocity of product. 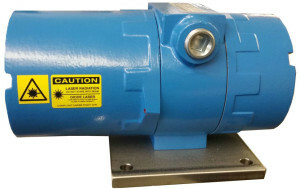 This Laser incorporates a fast intelligent processor with special filtering that removes non-valid values and enables restriction of non-valid distance values. The zero offset and the span of the 4 – 20 mA analogue output are both user programmable. The distance offset is also user programmable to allow the user to define a zero point independent of the analogue output zero offset. Provided with a user programmable digital switching output triggered by exceeding in the positive or negative direction a specified distance threshold. The hysterisis of the digital switching output is also programmable. length determination as well as determining the position of the product inside the furnace. Incorporates water cooled chamber and direct air purge to prevent lens contamination. For severe high radiant and ambient heat water cooled enclosure is available as well as an optional heat protective Kevlar insulated cover is available. Up to 90% of external heat sources are reflected away. Provides a unique combination of thermal insulation and heat reflective qualities in high ambient conditions or alongside external radiating heat sources. Supplied as standard with RS232 or RS422 serial interface with a 2400 to 38,400 baud rate & a programmable 4-20 mA 16 BIT analogue output.